Why Retail Jewelers Are Closing All Over the U.S. The jewelry industry is rapidly changing. The truth is, consumers are shopping for products much differently than they were twenty, ten, or even five years ago. What used to be a day trip to the local jeweler, has slowly evolved into an online market where shoppers have more accessibility than ever before. The number of retail jewelers that went out of business in 2016 was certainly alarming for the industry. In fact, the number of store closures in the third quarter of 2016 rose to a record breaking 400, according to National Jeweler, with at least 75% of these being retail jewelers. Jewelry industry analysts and CEOs of retail jewelry conglomerates are all examining the downward trend in retail sales with a microscope. In fact, many CEOs have been stepping down as a result of poor fiscal reports. For instance, famed luxury retail jeweler Tiffany & Co has recently had disappointing financial results. This led now former Tiffany CEO Frederic Cumenal to step down just after the start of this year. 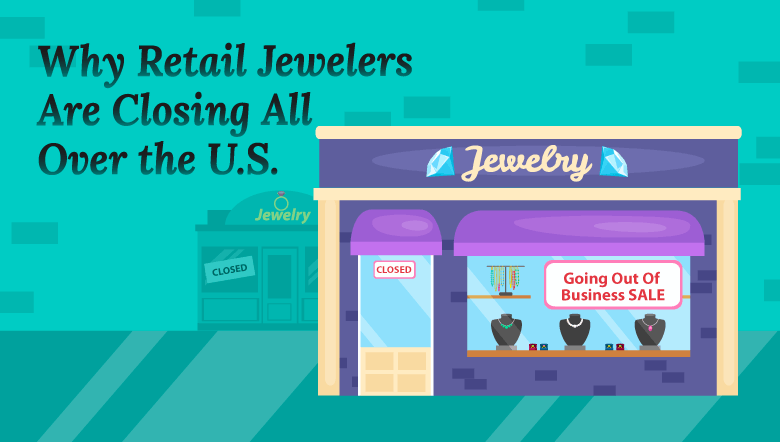 The online market was not invented recently, so why are brick and mortar jewelers closing all over the U.S. at these rates only over the past couple of years? The baby boomer generation of retail jewelers are reaching, or are past, retirement age. This means they will inevitably close up shop. They could pass on the business, but the motivation simply isn’t there for their children or millennial grandchildren. Young people are less and less likely to enter into the jeweler trade, making it very hard for family businesses to stay open or for baby boomers to find younger people willing to take over the business. 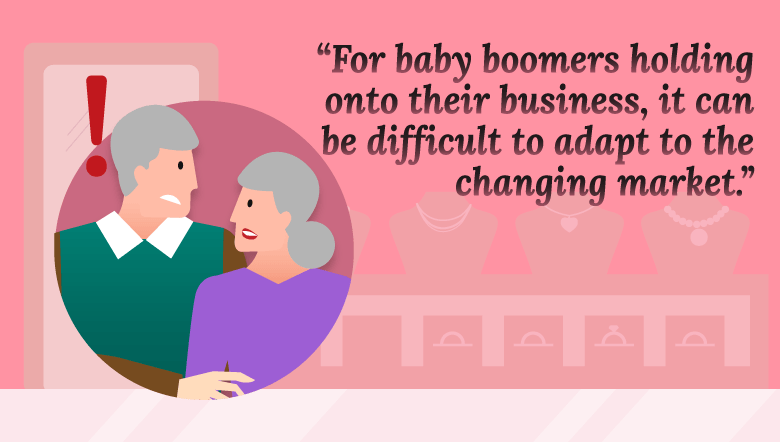 For baby boomers holding on to their business, it can be difficult to adapt to the changing market. Millennials are another key reason online jewelers are more successful than brick-and-mortar stores. Millennials are more internet savvy, and prefer looking for the best deal over loyalty to local stores. “Price has the greatest influence on millennials’ purchase decisions above all other factors, including quality, brand, store and availability,” explains Peter Gasca of Entrepreneur. Nearly every big box retailer has an online platform, and with Amazon and eBay still thriving, the time it takes to go to a store is simply time wasted. According to The Wall Street Journal, consumers made 51 percent of their purchases online in 2016. It is certainly not a big increase from the 48 percent in 2015, but it is still a clear indicator of shopping trends. 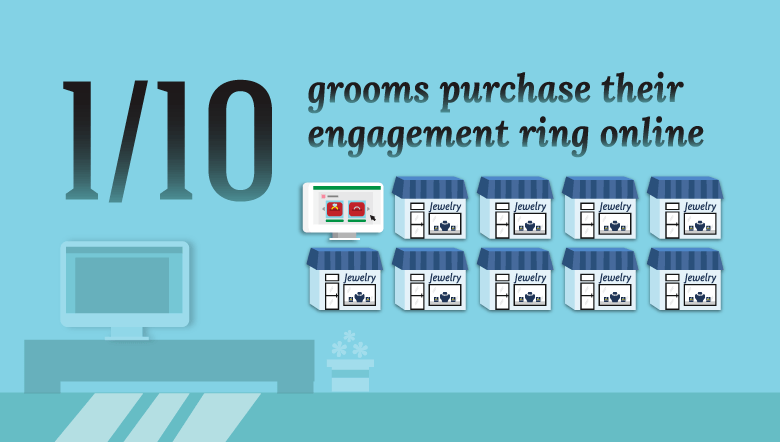 In fact, today roughly 1 in 10 grooms are choosing to purchase their engagement rings online. This has fueled the success of online jewelers, making them stern competition for any storefront. Whether you consider corporate entities like Tiffany’s, or the family owned community jeweler, they simply can’t keep up. Custom jewelry is still a niche storefronts can benefit from. However, the overall experience of buying in a store may be a thing of the past. The thrill of buying jewelry in a store is gone. Whether shopping for an engagement ring, or a new watch, consumers want space and time to decide. The stress of having a salesperson hovering over you can be off-putting. 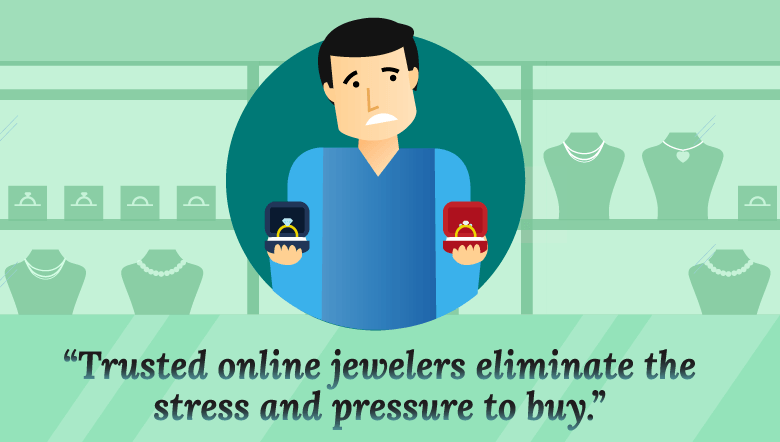 Trusted online jewelers eliminate the stress and pressure to buy. In most cases buying online has a far better customer experience. Online jewelers know that their success hinges heavily on customer reviews, and any reliable online jeweler ensures quality products and expert support every step of the way. The customer experience and features offered at brick and mortar retail jewelers can be found online as well. The most trusted online jewelers, like Brilliance, have free shipping, free ring sizing, lifetime warranties, no-hassle returns, and prices that meet every budget. What about seeing the actual jewelry? The best online jewelers offer 360-degree views of their products with detailed information about the gems, materials, and settings. You can even view third party certificates, like a GIA certification, to ensure you are getting exactly what you pay for, and expect to receive the original copies of these certifications with your purchase. Buying jewelry online is the preferred choice for many in order to skip the hovering salesperson. According to PayScale, the median hourly wage for a Jewelry Sales Consultant is $11.42 per hour. This makes them hungrier for commission and they may strong-arm you a bit from across the glass. Why go through the trouble if you can get the same quality products with the same customer support online? People are also quite busy these days, and finding the time to visit multiple retail jewelers to compare quality and price is simply not realistic. Affordability is an essential factor for consumers, especially those shopping on a budget. Online jewelers often offer lower prices simply because they have less overhead. Brick and mortar retail jewelers have higher rent, personnel, security, and storage costs, just to list a few. 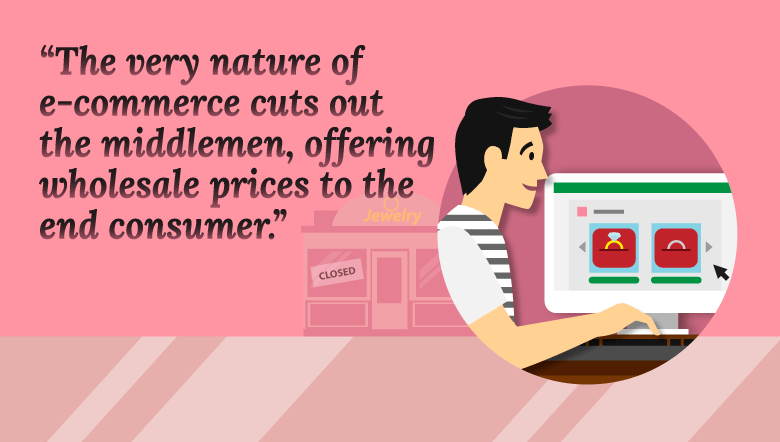 The very nature of e-commerce cuts out the middlemen, offering wholesale prices to the end consumer. The overhead for online jewelers is minimized, and price comparisons with other platforms keeps markups lower as well. For instance, you can save 30 to 50 percent over a brick and mortar purchase when buying an engagement ring online. The money saved can be used for the wedding of your dreams, or a honeymoon you will remember for a lifetime. The digital era has ushered in innovative ways for people to shop. It has also given consumers a powerful tool to browse multiple jewelers and compare prices from the comfort of their sofas. Are brick and mortar retail jewelers a thing of the past? Those who fail to optimize their online presence via e-commerce will certainly join the hundreds of retail jewelers who have already closed their storefronts for good. With quality selection, budget friendly prices, and expert support, consider Brilliance.com the next time you want to treat yourself, or a loved one, to a little something special.